Late in 1947 the big news on the textiles front was the development of a process that allowed photographs to be printed on fabric. It was so big that Life magazine reported on the new printing processes in December of 1947. 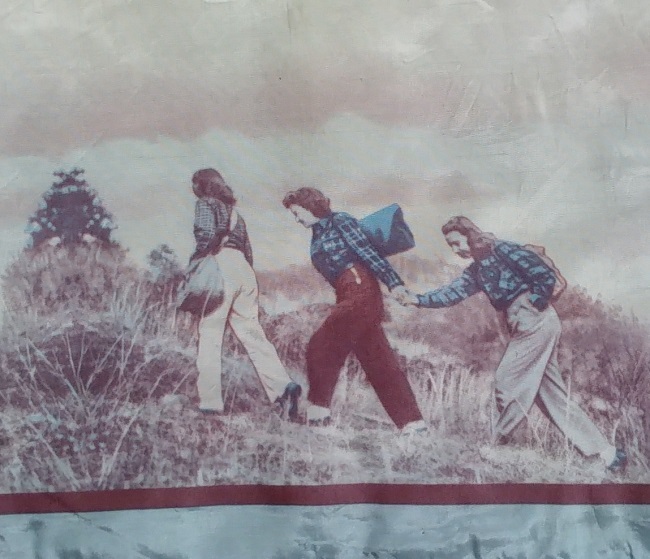 Today, photos printed on fabrics are everywhere, and one can even do it at home on their own computer. And when I think of vintage photo prints, I tend to think of those from the 1970s that were printed on polyester knits. Occasionally a photo printed piece from the 1940s surfaces on the market. Most of the ones I have seen are multiple photos of a place. I have seen prints of San Francisco and of Seattle. I have also seen a fabric that had a variety of travel destinations. And at the present time there are Florida and Hawaii themed photo print garments for sale on eBay. I had been wanting to add one of these unusual prints to my collection, but had been holding out for a woman’s garment in a travel print. 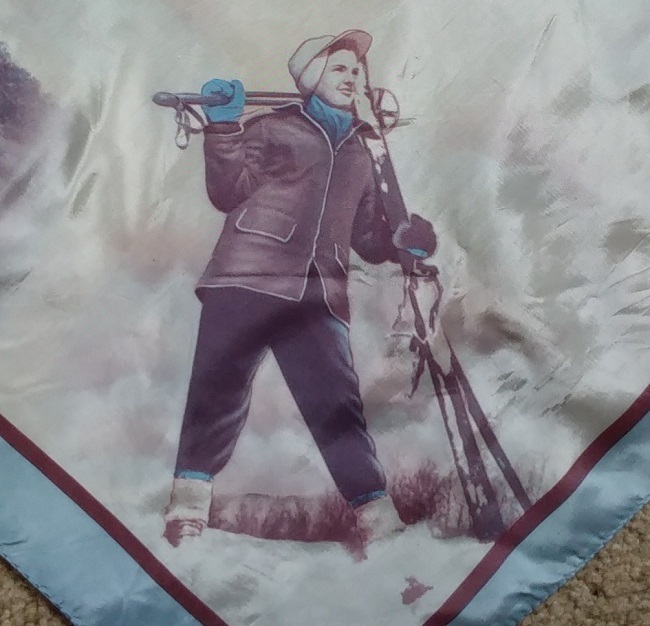 As luck would have it, I stumbled on a sports themed print on a scarf instead. 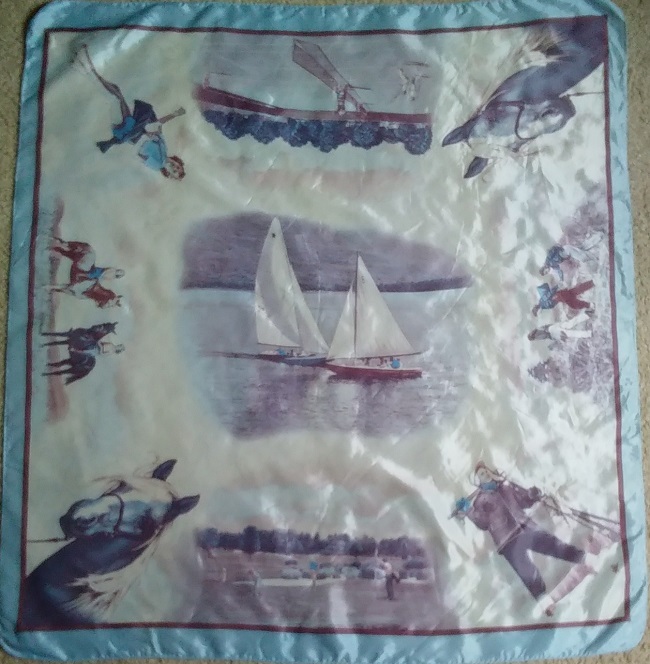 This scarf is from the late 1940s or early 50s, and seems to be printed on parachute silk. I say seems to be because there is not enough available random fiber to do a burn test. The other alternative is that this is a thin and crisp acetate. I especially love that most of the sports people are women, and that they are dressed in practical clothing for active sports. 1947 it seems was a fairly big fashion year? Was it not the “New Look” of Dior year? Also Mc Cardell introduced her sportswear? The scarf sports theme I agree is really special. Thank you as always. It was a big year for fashion and for innovation! 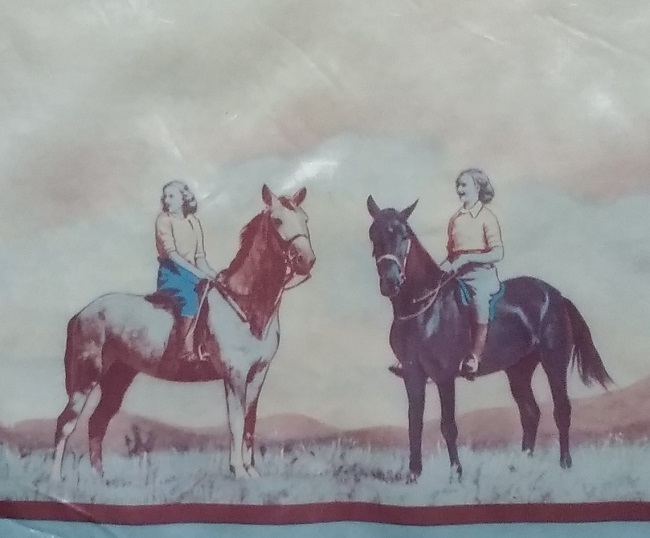 Of COURSE there had to be the huge face of a horse as a repeated pattern on women’s sportswear! (If there was such a thing as a gender test, surely horse love/longing would be on it.) Adore seeing that climber literally lending a hand to help another up a steep incline — the personification of the old saying “steady as she goes”! 😉 Love the message of fit, female, and fabulous fashion, dahling! Absolutely, there did have to be a horse for the sporty girl. Fabulous find. 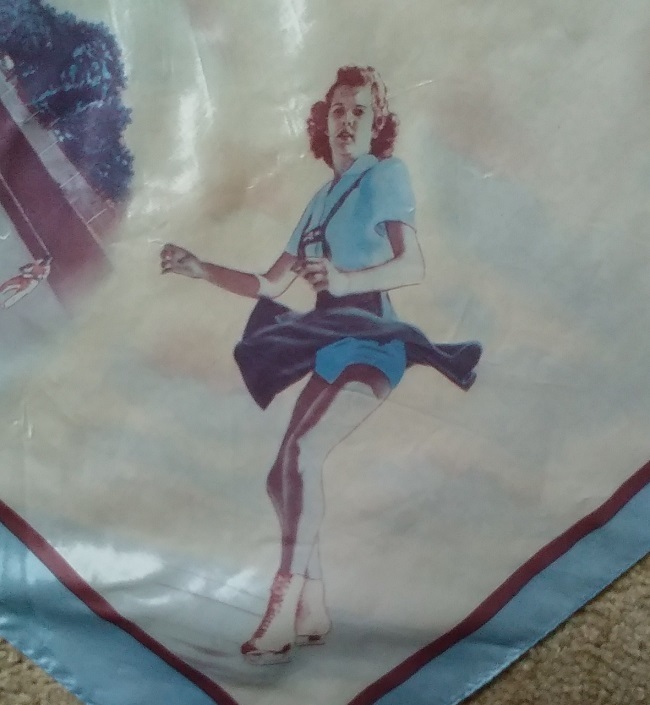 I think the skater might be Tenley Albright who won the 1956 Olympic figure skating gold medal. Thanks so much for Tenley’s name. It does look a lot like her. I’ve seen them on souvenir pillow covers! Some kind of silky acetate I think. Love your scarf.